The design is inspired women in science and engineering at the beginning of the twentieth century and influenced by the work of the Russian textile artist, Liubov Popova. Popova was a prolific and inspirational female artist gaining success at a similar time to Amy Johnson. Reference is also made to computer programmer Grace Hopper who, when working on the Harvard Mark II just after the Second World War, discovered a moth affecting the system. This is how the term ‘computer bug’ was coined. 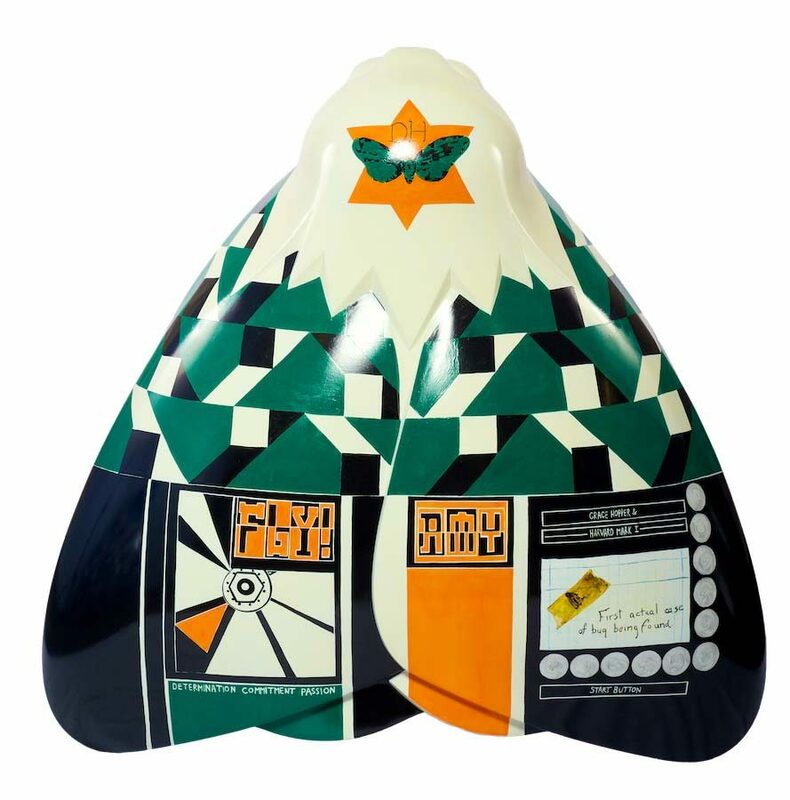 A dynamic geometric pattern covers the wings of the moth. The constructivist imagery refers to the rise of machines, technology, and industry in the work of certain groups of artists as well as the wider society. Staff from the Wilberforce Medical Centre collaborated with artist, Clare Holdstock, to produce their design. The group involved included employees from the Story Street Medical Practice and the Paul for Brain Recovery Charity, both based at the centre. Clare Holdstock is a Hull-born artist who studied at the University of Arts in London. She came back to live in Hull after the city was appointed the City of Culture UK status for 2017. She worked with the group and discussed Amy Johnson’s story to inspire the final design. Hull Citycare is a market leading strategic estates partnership company that supports the public sector in delivering their estates ambitions. The public and private partnership, established in 2004, has delivered 13 new health and wellbeing centres across the city, integrating a range of services and creating over £250m of economic benefit.